Most breeds of pig are farmed and kept for the consumption of their flesh, called pork. Although it’s not uncommon for some pig breeds such as Micro Pigs and the Pot-Bellied pig, are also kept as pets. The majority of pig breeds have a large head with a long snout which is strengthened by a special prenasal bone and cartilage. The snout is used to dig into the soil to find food and gives pigs a very acute sense of smell. Pig have four hoofed toes on each foot, with the two larger central toes being used for carrying the majority of the weight, the outer two are also used in soft ground. All pig breeds have a dental formula of 44 teeth. The rear teeth are adapted for crushing and in the male the canine teeth can form tusks, which grow continuously and are sharpened by constantly being ground against each other. How are Pig Breeds Classified? In the United Kingdom pig breeds can be classified into either native or commercial breeds. Native breeds tend to be fewer in their population and are usually outdoor reared by smaller farmers, small holders or those individual who want to know where their food comes from and how the pig is fed – food provenance and pig adoption is becoming increasingly popular. 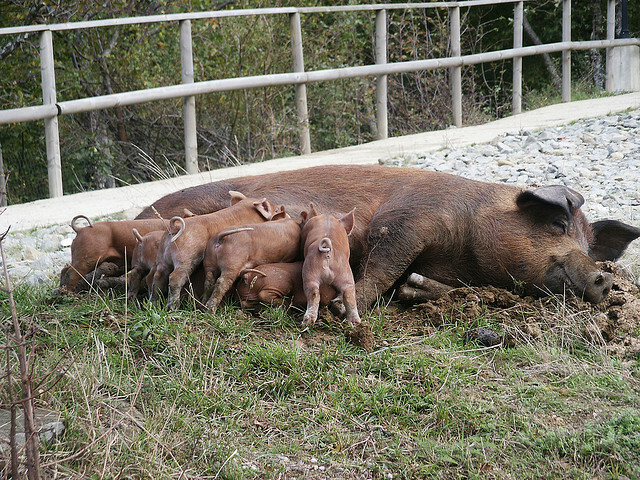 Commercial breeds of pig are often imported from foreign countries and genetically cross bred to meet the supermarket sdemand for faster growing pigs. Commercial breeds of pigs are often kept indoors and live in quite tight, factory like conditions to ensure they mature early. With various scandals and animal welfare increasingly in the public eye many pork eaters are turning to farm shops and more ethical means of pork production which can only ever be a good thing. The native pig of the British Isles was a large, rangy, lop-eared beast that roamed forests (using a pannage system), or later in gardens of rural dwellings and cottages. In the late 18th century fat, prick-eared pigs of Asian origin were introduced into the United Kingdom. The mingling of these two types formed the basis for the creation of all the native British breeds, and these were the dominant breeds until the second half of the twentieth century. Although at this time numbers for the Wessex and Essex breeds (now combined as British Saddleback) and the Large Black were still reasonably healthy, others such as the Berkshire, Middle White and Tamworth numbers showed a considerable decline. This was probably due to demand for a different type of pig for bacon, and in 1955 it was recommend that British pig farming should focus on just three breeds of pig: Large White, Landrace and Welsh. Native pig breeds which became extinct include the Cumberland, Lincolnshire Curly Coated, Ulster White, Dorset Gold Tip and Yorkshire Blue. They possessed special and distinctive characteristics which are now no longer available to us. The native breeds, which have survived, are demonstrating their qualities already as the marketplace is again changing with more and more consumers wanting traditionally reared pork to satisfy both their taste buds and their moral beliefs. This is switching the focus and attention of pig farmers onto the conservation of native pig breeds.